A SURVEY of the portraits which Frans Hals painted will disabuse the mind of at least one prejudice concerning the great painter. It will go far to put an end to the view, which has been expressed by many writers, that Hals was a mere painter of externals; one who caught the surface peculiarities of a man and could present them to us with astonishing verve and vraisemblance—much, indeed, like Charles Dickens in literature—but who did not penetrate beneath the surface, or read the inner man very subtly. One may fully grant that Frans Hals was not a thinker in the sense in which Rembrandt, Velasquez, and even Van Dyck, were thinkers; and there are, I dare say, very few of us who have not at some time or other, in standing before one of Hals's brilliant, dashing bits of rapid character-catching, found ourselves expressing the inward doubt whether Hals realized that his sitters had souls at all. The injustice is due, I am persuaded, to the fact that few people have ever taken the trouble to view Hals as a whole. For some reason, there has been an unconscious conspiracy, both among picture-lovers and writers, to think of him through one or two of his most astonishing, and, indeed, incomparable achievements as a rapid setter-down of facial expression. But anyone who has stood long before the gentleman and his wife of the Cassel Gallery; the Jacob Olycan and Aletta Hanemans of the Hague; the Albert Van der Meer and his wife of Haarlem; the Beresteyn pair of the Louvre; the old housewife of the same gallery, and, above all, the consummate portrait of Maria Voogt, 1639, at Amsterdam, not to speak of many others, will have to reconsider his verdict. Hals has shown himself in these to be as perfectly capable of handling a worthy face with quiet dignity and full insight—remember that his sitters were Dutch, who do not carry their souls upon their faces, nor their hearts upon their sleeves—as he was capable of setting down the rapidly-passing expression of his Laughing Cavalier, his Jester at Amsterdam, his Gipsy Girl of the Louvre, and his Hille Bobbe of Berlin. The fact that he painted these latter, and more like them, has no business to rob him of his great reputation as a great translator of the more worthy moods of man, which is due to him on the evidence of a far larger body of witnesses. For if the list of his portraits be perused, it will be found that these laughing drinkers and jesters, by which the world has insisted on judging him, are in quite a small minority. The minority would be probably far more strikingly small, if anything like the tale of his output had survived to us. And I shall make no separate classification for one kind of portrait and the other. As I have already said, his jesters, his gipsies, his mountebanks, his fisher-boys or his fishwives, are just as much portraits as the others. The fact that he very likely picked some of his models up in his pothouse, and others in the street, and others by the roadside, or by Zandvoort dunes, or in the Haarlem fish-market, and carried them off in triumph to his studio, does not make them a whit less portraits. These were the only kind of sitters who would consent to have their portraits painted to go down to posterity with a face convulsed with laughter, or contorted with some passing expression. He must either use that kind of sitter—not but what I quite admit that Hals probably got great amusement from their company—or abandon that field of art—facial expression under rapid change, which was the problem he was mastering. They are not an edifying set of sitters; far from it; but the artist who wants to get a model who will sit to him with a broad grin on his face will not find his man among the high-bred, the serious, the refined. The man who will sit in a studio with a stoup of ale on his knee and laugh boisterously at little or nothing at all, between the drains, is not a refined person. But he gets the lines of his face into the shapes which express laughter more frequently than the doctor of laws or the professor of mathematics, and Hals can get what he wants from him, and perhaps a rough joke or two into the bargain. 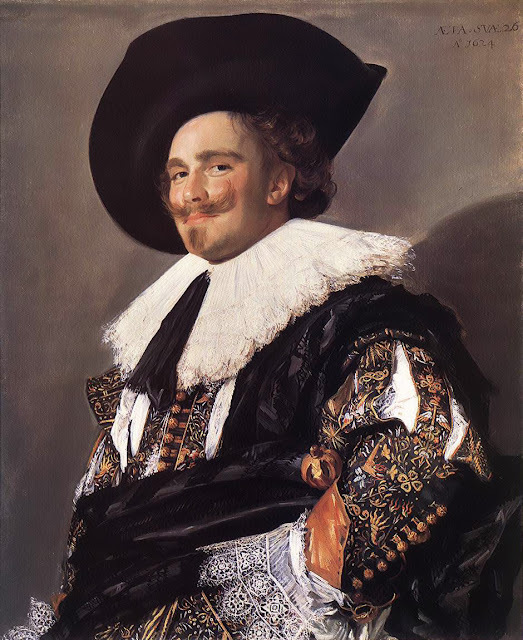 One year before Hals had completed the Olycan pair (Jacob Olycan and his wife, 1625, both at The Hague,) he had painted his Portrait of an Officer—known as The Laughing Cavalier—of the Wallace Collection, 1624. Of Hals's work accessible in public galleries of England, no more striking specimen exists. Here, indeed, we have the painter rejoicing in the interpretation of a phase of character which had particular attractions for him. The cavalier is a young, well-fed, well-kept soldier, quite satisfied with himself, and evidently quite untroubled by any of those deeper searchings of the mind which are apt to leave their print upon the face. The smile upon his face is certainly one of the most irresistible things that ever was painted. It is not a laugh, nor a leer, nor a grin, but a smile which seems ready to burst into a laugh, and, as you watch the face, it takes slight and rapid variations of expression, so that you seem to see the look which has just passed and that which is just to come. No doubt there is a certain air of swagger,—a characteristic which Hals always enjoyed the rendering of. But this is no mere swaggerer or swashbuckler. On the contrary, there is a force and even a fineness about the handsome brows that tell you this would be a bad man to have to meet in an encounter, and a good man to have to follow to one. Stand before this man's portrait, and you can weave for him a history. There is something more than mere swagger in that self-assertive smile. He looks out at you with an air of supreme contempt at one moment, of supreme good-nature at another; but the expression is full of changefulness, full of that electric current which plays over the human face and tells you while you look at it at one moment, what to expect from the next. This was not a reader or a thinker, but he was not a mere vapourer or a mere braggart, like the Merry Toper of the Amsterdam Gallery. A fighter you may make oath upon that, and a man of action when he is wanted. Technically it is the highest merit, and is nearly, if not quite, as it left the painter's hands. Even as it hangs on that wall in the company of Rembrandt, of Van Dyck, of Velasquez, it yields to none in that particular. It is for a man's portrait more highly wrought than is his wont. The handling is not so fierce, if one may use the expression, as, for example, in his Doelen pictures. It represents the halfway between the St. Joris of 1616 and the St. Joris of 1627. Viewed close, the detail is somewhat more exact and less the production of summarized knowledge than is often the case. Even the lace collar is, for a man's portrait by him, highly wrought. There is no strong colour in the picture. The elaborate broidery is all in low-tone orange-yellow on a cloth of blue gray. There is not a bit of pure vermilion, or crimson, or blue in the picture. And yet the impression left by the picture certainly is that its scale is somewhat higher than many of Hals's individual portraits. The explanation lies doubtless in the fact that the picture is slightly wanting in atmosphere, and does not go behind its frame.